Book Dedication: To all those who dream, And to my family who taught me how. I would tell people that you should step outside your comfort zone with books because it is good to add more authors and genres to your reading portfolio even if you do not read books of this genre. I normally read books of romance genre but not fantasy but l stepped outside my comfort zone with authors and genres. I am so glad l did because l have read so many great books and come across some great authors. I highly recommend this book but l would tell people that you should have the full series so you can read them all one after another. Synopsis: Molly has not slept well since the night of her twenty four birthday being struck by lightning might have something to do with it, but then again, her chicken did look a little under cooked at dinner. Whatever the culprit, her life quickly catapults from mundane to insane as, night after night, Molly is transported through her once dreamless sleep to mysterious land illuminated by shooting stars. there she meets the captivating but frustrating Dev, And together they discover Molly possesses a power coveted by his people - the ability to conjure almost anything she desires in to existence. seduced by the possibilities of this gift, Molly shifts her attention from waking life toward the man, the magic, and the world found in her dreams. But Molly must ask herself does something truly exist if you can only see it when you close your eyes? Faced with the threat of losing everything - her job, best friend, boyfriend, and most importantly, that little thing called her sanity - Molly will learn just how far she will go to uncover what is real and what is merely a figment of her imagination. The first in a spellbinding contemporary fantasy trilogy, the dreamer opens doors in to the subconscious and follows the journey of a young woman torn between two worlds as she questions the power of the mind and battles between fate and free will. This book has 331 pages and 30 chapters in it. Review: It was sad to read that Molly went from having a nice evening meal out with her boyfriend Jared for her birthday to lying in a hospital bed after being struck by lightning. Her boyfriend Jared bought her a bracelet and it melted on to her wrist when the lightning hit her. Luckily she lived to tell the tale. I love reading about Molly's dream and where she goes. Before the lightning hit Molly she never use to dream but now she dreams every night the same dream over and over again. This book was really easy to get in to. I was hooked after reading the first page. I really enjoyed reading about Molly, Jared, Becca and Molly's family. I can not wait to read the dreamcatcher and the divide. I am in love with this series and storyline. It did not take me long to read this book. It was weird to read how quick Molly's wound healed.It is nice that molly is starting to go out after being struck by lightning. This story will have you hooked and wanting more. I liked reading about Dev, Aveline and Tim. Reading about Molly's dreams makes me wonder if Dev, Aveline and Tim are dreaming too. I can not put in to words how great this book is l would tell people to read it for themselves to know how great it really is. It is exciting to read more about Molly and Dev. It was horrible to read that Dev pushed Molly off a cliff to wake her up. It was funny that Molly slapped Dev for pushing her off the cliff. There was something trying to turn dreams in to nightmares that is why Dev pushed Molly off the cliff so she did not see them. I am so happy that Molly will be able to go back to work so she is not sitting in her apartment bored. I hope Molly gets good news when she goes back to her doctor after being struck by lightning. This story gets better and better as l read on. I can not get enough of Molly and Dev. Dev told Molly to leave because she was in danger. I am so glad l can carry on the series. Jared sounds like a great guy. This story is amazing. Molly would do anything to get the answers she wants even trying to get in to the council meeting and getting arrested to get them. Molly took sleeping tablets to go back to sleep so she could go back to ask Dev for answers. Molly thinks she is going crazy or something. l am hooked on this series l can not put this book down once l started reading it. It did not take me long to read this book. Dev sent Rae with a shell that him and Molly had found on the beach when they first met to tell Molly everything was real and Dev was real too. Jared had not texted or rung Molly in days. She thought they had broke up. Wow l can not believe Dev is 140 years old and it is good to read that Molly is getting her questions answered and it was interesting to read that dreamers have been apart of every war there has been and helped win them. The children that will join Dev, Tim and Aveline are kept somewhere else to keep them safe until they come of age. I am so glad that Molly and Jared are not breaking up. Molly has to lie to all the people she loves so she can help Dev, Tim and Aveline. I hope Molly stays with Jared. Becca is going to be heart broken when Rae disappears glad she has a great friend like Molly. I was shocked it was real not a dream. About The Author: E.J. Mellow is a fantasy writer who resides in brooklyn, New York when she is not busy moon-lighting in the realm of make-believe, she can be found doodling, buried in a book (usually this one) or playing video games. 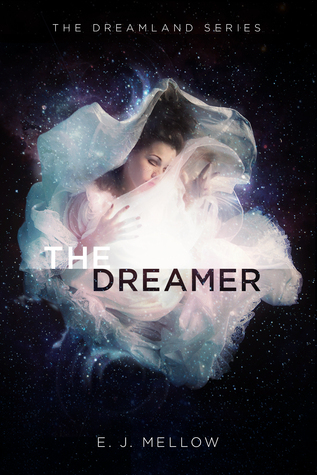 The dreamer is the first book in her new adult contemporary fantasy trilogy, The Dreamland series. E.J. Mellow is really nice and kind. About The Book: This book has won awards which it deserves every award it gets. I love the cover and font.